رهگذر, محمد علی, زارع, محمد رضا, هاشمی فشارکی, سید محمد. (1394). پیشنهاد شبکه هوشمند ارزیابی شاخص آسیب‌پذیری لرزه‌ای شبکه جمع‌آوری فاضلاب در بستر GIS (مطالعه موردی: شهرکرد). مجله آب و فاضلاب, 26(6), 5-15. محمد علی رهگذر; محمد رضا زارع; سید محمد هاشمی فشارکی. "پیشنهاد شبکه هوشمند ارزیابی شاخص آسیب‌پذیری لرزه‌ای شبکه جمع‌آوری فاضلاب در بستر GIS (مطالعه موردی: شهرکرد)". مجله آب و فاضلاب, 26, 6, 1394, 5-15. رهگذر, محمد علی, زارع, محمد رضا, هاشمی فشارکی, سید محمد. (1394). 'پیشنهاد شبکه هوشمند ارزیابی شاخص آسیب‌پذیری لرزه‌ای شبکه جمع‌آوری فاضلاب در بستر GIS (مطالعه موردی: شهرکرد)', مجله آب و فاضلاب, 26(6), pp. 5-15. رهگذر, محمد علی, زارع, محمد رضا, هاشمی فشارکی, سید محمد. پیشنهاد شبکه هوشمند ارزیابی شاخص آسیب‌پذیری لرزه‌ای شبکه جمع‌آوری فاضلاب در بستر GIS (مطالعه موردی: شهرکرد). 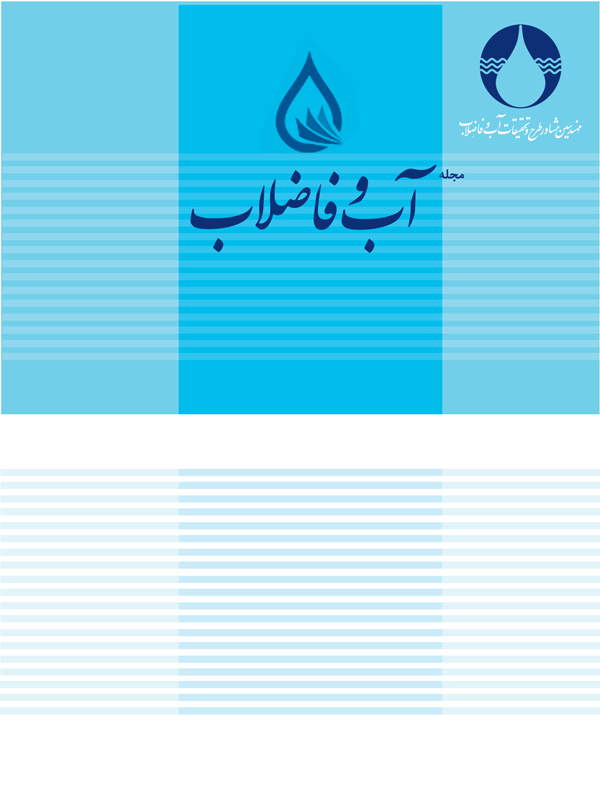 مجله آب و فاضلاب, 1394; 26(6): 5-15. شبکه جمع‌آوری فاضلاب به موجب پراکندگی و قرارگیری در سطح وسیعی از گستره زمین، در هنگام زلزله در معرض آسیب‌های فراوانی قرار دارد. این آسیب‌دیدگی علاوه بر زیان مستقیم به شبکه، پیامدهایی همچون آلودگی محیط زیست را نیز به‌دنبال دارد. در هنگام زلزله‌های بزرگ، تعمیرات خرابی‌های متعدد در شبکه از جمله شکست لوله‌ها و تخریب اتصالات آنها بسیار پرهزینه و زمان‌بر است. بنابراین از دیدگاه مدیریت ریسک زلزله، وجود ابزاری هوشمند که قادر به ارزیابی آسیب‌پذیری لرزه‌ای برای هر نقطه از شبکه جمع‌آوری فاضلاب به‌عنوان یک شریان‌ حیاتی و در هر لحظه از زمان باشد، بسیار با اهمیت است. در این مقاله با استفاده از "روش وزندهی و ارائه الگوریتمی هوشمند تحت سیستم اطلاعات جغرافیایی GIS که قابلیت به‌روز رسانی اطلاعات ورودی شبکه را بسته به زمان و مکان دارا باشد، به ارزیابی شاخص آسیب‌پذیری لرزه‌ای شبکه‌های عظیم جمع‌آوری فاضلاب شهری پرداخته شد. به‌عنوان یک مطالعه موردی، نقشه‌های پهنه‌بندی شاخص آسیب‌پذیری لرزه‌ای شبکه جمع‌آوری فاضلاب شهرکرد، منطقه‌ای با خطر لرزه‌ای بالا، در بستر GIS ارائه شد. نتایج نشان می‌دهد که شاخص آسیب‌پذیری لرزه‌‌ای خطوط لوله‌ فاضلاب شهرکرد در حد کم و متوسط است و در جنوب شهرکرد به‌خصوص در بافت قدیمی شهر که لوله‌های آن ترد است، از دیگر نقاط بیشتر است. 1. Zare, M.R., Wilkinson, S., and Potangaroa, R.T. (2010). “Vulnerability of wastewater treatment plants and wastewater pumping stations to earthquakes.” Disaster Planing and Management Conf. Cobra 2010, Rics and Dauphinek University, Paris, France. 2. Zare, M., and Wilkinson, S. (2011). “Earthquake damage in wastewater systems and post earthquake repair methods : Limitation and practice.” Australian Earthquake Engineering Society Conference, Novotel Barossa Valley Resort, South Australia. 3. Fukushima, K., Kinoshita, K., Watanabe, T., and Masuta, T. ( 2006) Investigation and forecast earthquake damage for sewerage systems, Japan Institute of Wastewater Engineering Technology, Tokyo, 171.0021, Japan. 4. Toprak, S. (1998). “Earthquake effects on buried lifeline systems”. Doctorate Thesis, Faculty of the Graduate School of Cornell University. 5. Federal Emergency Management Agency (FEMA). (2000). Estimating earthquake losses with HAZUS, Federal Emergency Management Agency, USA. 6. American Lifelines Alliance. (2004). Wastewater system performanceassessment guidelines, American Society of Civil Engineers (ASCE) and Federal Emergency Management Agency (FEMA), USA. 7. American Lifelines Alliance. (2001) Seismic fragility formulations for water systems, American Society of Civil Engineers (ASCE) and Federal Emergency Management Agency (FEMA), USA. 8. RISK-UE, Geo-Ter. (2003). Vulnerability assessment of lifelines and essential facilities (WP06): Methodological handbook, Potable water utility system. Report NO. GTR-RSK 0101-152av7, February. 9. Halfaya, F.Z., Bensaibi, M., and Davenne, L. (2014). “Seismic vulnerability curves of water.” Australian Journal of Bacis and Applied Sciences, 8 (19), 21-25. 10. Eidinger, J.M., and Young, J.A. (1993) “Preparedness, performance and mitigation for EBMUD water distribution system for scenario earthquakes.” Proceedings of National Earthquake Conf., Central US Earthquake Consortium, Memphis, Vol. II, p 615-623..
11. Shinozuka, M. (1994). Systems analysis for Memphis Light, gas and water, Research Accomplishments, 1986-1994: NCEER, State Univ. of New York at Buffalo, p. 197-206,. 12. Schiff, A.J., and Buckle, I.G. (1995). “Critical issues and state-of-the-art in lifeline earthquake engineering.” Technical Council on Lifeline Earthquake Engineering, Monograph 7, ASCE, New York, 92 pages. 13. Dodge, C.F., and Pratt, D.L. (1995). “Mokelumne aqueduct seismic upgrade project.” Proceedings of the 4th U.S. Conf. on Lifeline Earthquake Eng., ASCE, New York, p. 723-730. 14. Hopkins, D.C., and Leslie, P.D. (1995). “Securing Wellington's water supply 20-year mitigation plan based on seismic risk assessment.” Proceedings of the 4th U.S. Conf. on Lifeline Earthquake Engineering, ASCE, New York, p. 731-738. 15. Sato, T. (1998). “Earthquake damage to buried water supply pipes and their renovation by hose lining technology.” Proceedings of the 7th U.S.-Japan Workshop on Earthquake Disaster Prevention for Lifeline Systems, EQE International, Inc., p. 39-53. 16. Takada, S. (1998). “Study on earthquake resistant performance of new rubber ring type U-PVC pipe for water distribution pipelines.” Proceedings of Third China-Japan-US Trilateral Symposium on Lifeline Earthquake Engineering, Kunming, China, p.349-356. 17. Shumuta, Y., Tohma, J., and Shiomi, S. (1998). “Long-term infrastructure/lifeline renewal planning and management with a focus on power and water: A study on optimization method for replacement or retrofitting of power facilities on the basis of risk management.” Multi-lateral Workshop on Development of Earthquake and Tsunami Disaster Mitigation Technologies and their Integration for the Asia-Pacific Region, p. 184-186. 18. Hosseini, M., and Mirza-Hessabi, A. (1999) “Lifeline interaction effects on the earthquake emergency response of fire departments in Tehran metropolis.” Proceedings of the 5th US Conference on Lifeline Earthquake Engineering, Seattle, USA. 19. Miyajima, M.I., and Naomi, K.M. (2000) “Study of retrofit prioritization of water supply pipeline considering required performance after earthquake.” Proceedings of the Sixth International Conference on Seismic Zonation: Managing Earthquake Risk in the 21st Century, Plam Springs, California. 20. Hosseini, M. (2003) “The latest achievements in the seismic evaluation methods and upgrading techniques for gas and water lifelines.” Proceedings of the 4th International Conference on Seismology and Earthquake Engineering (SEE 4), IIEES, Iran. 21. Hosseini, M., and Moshirvaziri, H. (2008). “A procedure for risk mitigation of water supply system in large and populated cities.” The 14th World Conference on Earthquake Engineering, China. 22. Ueno, J., Takada, S., and Kuwata, Y. (2004). “Performance of water supply system during the 2003 Tokachi-Oki earthquake.” NCREE Workshop, British Council in Taipei, Taiwan. 23. Zohra, H. F., Mahmoud, B., and Luc, D. (2012) “Vulnerability assessment of water supply network.” Energy Procedia, 18, 772-783. 24. Bargi, K. (1996). Seismic effect on buried gaz pipelines, Bulletin of Faculty of Engineering, Teheran University, pp 22-38. (In Persian). 25. Razavi, S.O. (2012). Numerical analysis of buried pipelines subject to inclined normal faults, Sharif University of Technology, Tehran. (In Persian). 26. Rahimzade, F., and Ghorbani, R. (2009). “Seismic performance of buried pipelines under earthquake body waves propogations.” Fourth National Conference on Civil Engineering, Teheran, University of Teheran (In Persian). 27. Pineda, O., and Ordaz, M. (2012). Seismic damage estimation in buried pipelines due to future earthquakes – The case of the Mexico city water system. earthquake-resistant structures – design.” Assessment and Rehabilitation, (51), 978-953. 28. Pineda, O., and Ordaz, M. (2007). “A new seismic intensity parameter to estimate damage in buried pipelines due to seismic wave propagation.” Journal of Earthquake Engineering, 11, 773-778. 29. Hashemi Fesharaki, S.M., Rahgozar, M.A., and Zare, M.R. (2014) “Evaluation of seismic vulnrebality of Shahr-e-kord sewerage network based on HAZUS-SR2 model.” Fifth National Conference on Earthquakes and Structures, Jahad-Daneshgahi, Kerman, Iran. (In Persian). 30. Hosseini, M., and Sarbandi Farahani, M. (2013) “Programing for water network repaires in large cities after earthquakes.” Research Bulletin of Seismology and EarthquakeEngineering, 13-24. (In Persian). 34. Memarian, H., Zare, M., Karimi, S., and Mohseni, A. (2008) “Seismic risk zonation and micro-zonation of Shahr-e-kord region.” 2nd Conference on Natural Disasters Hazard Mitigations, Teharan, Scientific Center for Surveying and Natural Disasters Hazard Mitigations, Faculty of Engineering, Teheran University. (In Persian). 37. Esrico. (2010). “Arc.GIS desktop version 10.1.” <<http://www.esri.com/software/aregis>> (July 2014).